Las Vegas, NV - Patriot Gold Corp. (PGOL) or ("Patriot Gold"), a gold and silver exploration and production company, today provided follow-up assay results returning 40% higher gold grades from additional sampling of visible high grade drill intervals at the Penelas and Penelas East target areas at the Bruner gold project located in Nye County, Nevada. Drilling thus far in 2014 at the Bruner project site has uncovered more visible gold this year than in the past which has led to a more thorough review of previous samples. Visible gold findings from the intercept on the Penelas vein in (RC) drill hole B-1430 prompted further metallic screen analyses which clearly indicate that particulate gold is present. 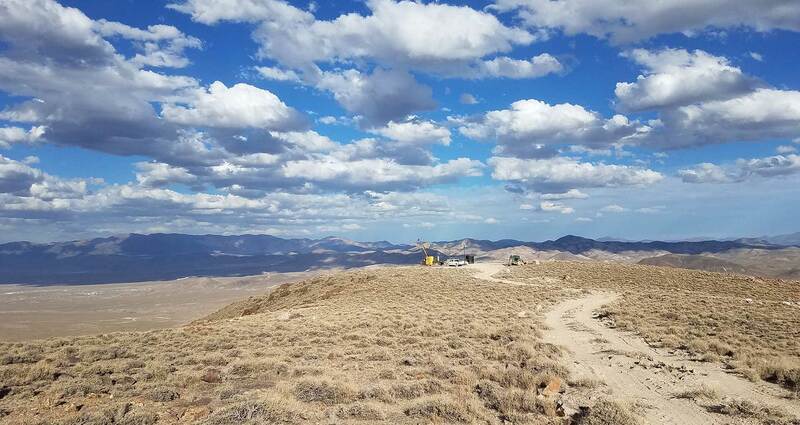 "The higher gold grade assay results from the Penelas target areas further enhance our belief that the Bruner project has the ability to deliver significant value," said Bob Coale, CEO of Patriot Gold. "With further drilling planned for the remainder of the year, we remain optimistic in continuing to update our stakeholders with additional positive results surrounding the Bruner project for 2014 and beyond." In the metallic screen analysis of the high grade interval at drill hold B-1430, the +150 mesh size fraction comprised only 8% of the total gold content of the sample indicating that 92% of the gold falls in the -150 mesh which confirms that the gold is particulate (not coarse) and requires further review of sample preparation and assaying procedures to better quantify the gold content of each drill interval containing visible gold. The above results also show that the metallic screen analysis returned an average grade for the 3 meter (10 foot) interval tested of 20.25 g/tonne, compared to the original fire assay (FA) of 14.33 g/tonne and the 1000 gm pulp re-run of 15.3 g/tonne. Two fire assays on the -150 mesh fraction of the screen assay on interval 665-670 feet returned two widely disparate values of 30.8 and 10.9 g/tonne. The 1000 gm pulp generated a 7% higher average grade than the 250 gm pulp. The 1000 gm pulp from this high grade drill interval delivered an average grade of 16.43 g/tonne, a 40% increase from the original average grade of 11.73 g/tonne on the 250 gm pulp. With clear signs of particulate gold, pulverizing a large sample before splitting out a 30 gm split for fire assay is a more representative sample. Results from the metallic screen analysis on this interval are still pending. From the Bruner project 2012-2014 drilling program, all +3 g/tonne intercepts will be reviewed and evaluated in a similar manner with metallic screen analyses to be conducted should the fire assay data indicate potential particulate gold. Core drilling at Bruner is re-commencing to follow up on the high grade intercept encountered in RC hole B-1436. The first core hole is designed to be parallel and adjacent to hole B-1436, reaching a depth of 1000 feet in order to test the full thickness of the mineralization within the bi-lithic breccia which hosts the gold interval from 750-780 feet (end of hole). Depending on preliminary results, a second core hole will offset the first core hole by 20-30 meters to test continuity of mineralization along strike or up dip. Further core drilling plans will be determined based on these results along with other factors. Given the visible gold present at the Bruner project site, geologists have initiated investigative work. From thin section work, there appears to be a wide range of grain sizes to electrum (native gold + silver). Primary electrum has a high silver to gold ratio, generally occurring in grain sizes of 50-250 microns. Secondary electrum has a high gold to silver ratio (native gold), generally occurring in much finer grain sizes from 5-20 microns. Both are typically found as inclusions in iron oxides after pyrite. The latter features explain the excellent cyanide extractions of gold in the samples tested on the site to date. The fine-grained nature of the low-silver bearing electrum explains the "no-see-em" aspect of the average gold intercepts in the near surface environment at the historic resource area of the Bruner project site.